We offer a range of finance options, through V12 Finance, including Buy Now Pay Later and Classic Credit. Whether you're upgrading your equipment, expanding your current collection or just getting started, our finance options can help you to spread the cost of your new purchase. Choosing a finance option that is right for you is easy with our online calculator. You'll find this next to every eligible product and at the checkout. Finance options are available on orders over £200 and the majority of applications are processed within 15 minutes (during working hours) with many being instantly approved. Please be aware that Finance orders cannot be shipped to an alternate address and will only be dispatched to the billing address. Now you can buy the latest digital cameras and lenses, video cameras, binoculars, telescopes, studio lighting and lots more without having to worry about a large, upfront cost. Please note that any Finance applications which have not been completed within 12 hours of the original order time, will be cancelled automatically without notice, unless you contact us. In the case of duplicate orders where both payment methods are Finance, the oldest order will automatically be cancelled, without notice. If, for any reason, you are unable to complete the Finance application, please contact us. 1. Add your item(s) to the basket. The Finance Calculator here will allow you to see the Finance options available to you and will clearly display your deposit options, repayment amounts and APR (where applicable). The online calculator will only show you the finance options applicable to your order total. To be eligible for Finance, your order total must be £200 (excluding postage) or more. The maximum value depends on the finance option you choose. 2. Once you are happy with your order click proceed to checkout - Please be aware that Finance orders cannot be shipped to an alternate address and will only be dispatched to the billing address. Therefore in stages 2 (Billing information) and 3 (Delivery Information) these addresses must match. 3. On the payment information stage of the Checkout, select "Apply for Finance"
4. Click "Continue" and wait until your order is confirmed. Do not refresh or close your browser. You will be taken the the page below. 5. Click "Apply Now" and wait to be taken to the V12 website. 6. You will be taken to the page below. Here you can select your finance options using the drop down options to the right. 7. Choose your options and click "Apply Online Now" - You will now be taken to the V12 Finance website to complete your application. Applications are usually approved within 15 minutes, during working hours, and V12 will send you an email confirmation/further information. Your items are reserved until the application is approved. Your order will go ahead as normal once your application has been approved or it will be cancelled if the application is rejected. Please be aware that Finance orders cannot be shipped to an alternate address and will only be dispatched to the billing address, regardless of whether you choose an alternate delivery address when placing your order. Goods can only be delivered to the the address on the finance agreement. Please contact us for more information. Finance orders cannot be shipped to an alternate address and will only be dispatched to the billing address, regardless of whether you choose an alternate delivery address when placing your order. There are three options for Buy Now Pay Later, depending on how long you would like to defer the payment. With these options you can choose to pay the full amount in 6 / 9 /12 months (depending on the option you choose) and an additional settlement fee of £40*. You will pay no interest if the loan is repaid within your chosen time period. Should you decide not to pay the amount in full within the period, this will default to a credit bearing loan with a 19.9% APR** for the remaining period of 42, 39 or 36 months (depending on your original option chosen). Buy Now Pay Later is available on orders over £200. The maximum loan amount is £5000. You could therefore place an order with a value of up to £10,000 when placing a 50% deposit. The Finance calculator at the checkout will only show you the options applicable to your order total. *For finance agreements taken out with V12 Retail Finance via Wilkinson Cameras on or after September 1st 2017, the settlement fee for Buy Now, Pay Later is £40. For finance agreements taken out with V12 Retail Finance via Wilkinson Cameras on or before August 31st 2017, the settlement fee for Buy Now, Pay Later was £29. **For finance agreements taken out with V12 Retail Finance via Wilkinson Cameras on or after September 1st 2017, the credit bearing loan for Buy Now Pay Later options has an APR of 19.9%. 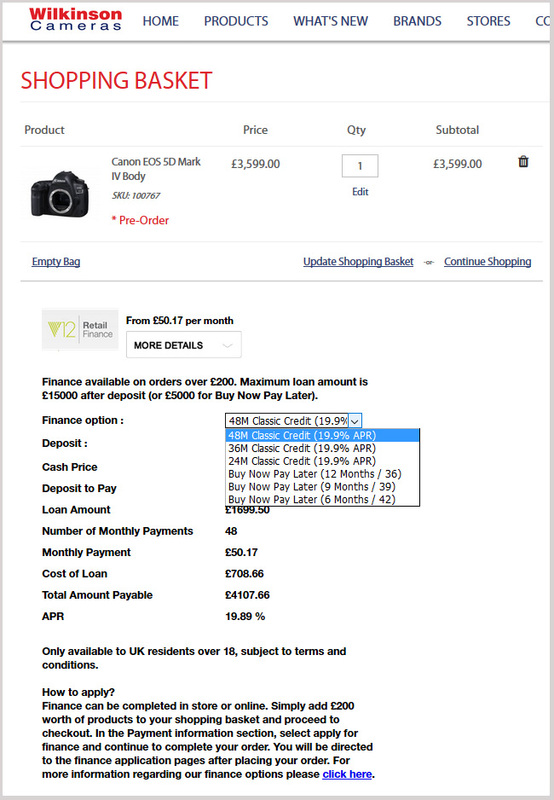 For finance agreements taken out with V12 Retail Finance via Wilkinson Cameras on or before August 31st 2017, the credit bearing loan for Buy Now Pay Later options has an APR of 29.8%. If you settle earlier than 36 months you will only pay the interest accrued over the number of months you have had the loan. Classic Credit in an interest bearing loan that allows you to easily spread the cost over a number of months. You can choose from 24 months, 36 months or 48 months. You will enter into an agreement to pay equal monthly installments over a fixed period of time. Interest is accrued at a rate of 19.9% APR. Our online calculator will show you your monthly payments and the total cost including interest for your chosen payment plan. Classic Credit is available on orders over £200. The maximum loan amount is £15,000. You could therefore place an order with a value of up to £30,000 when placing a 50% deposit. The Finance calculator at the checkout will only show you the options applicable to your order total. PLEASE READ CAREFULLY if buying a product with an Interest Free Finance offer. 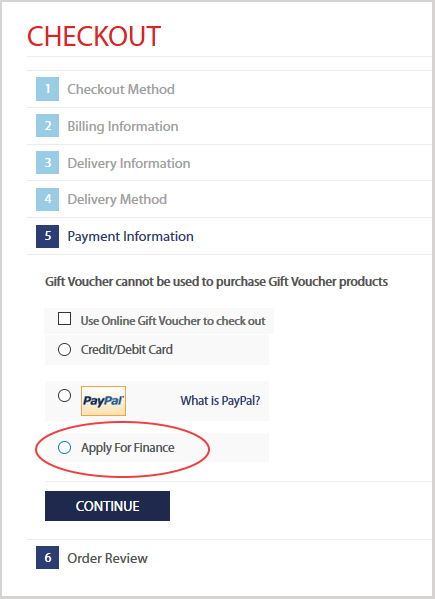 When selecting "Apply for Finance" at the checkout, you will then proceed to place your order using the "Place Order" button. From here, you will be redirected to the V12 Finance website. You will not be able to select an Interest Free Finance Option. Please simply close the window. We will be notified that you have selected to apply for finance and we will manually trigger an email with your application. We will aim to do this in as short a time as possible, but please allow up to 1 working day. The email will come from V12 Finance, not Wilkinson Cameras so please look out for this in your emails. Please note, that the only option for Interest Free Finance is a 12 month period with no deposit. More information on Finance can be found here. In regular employment (minimum of 16 hours per week) including self-employment, or in a permanent residence with your spouse/partner who's in regular employment. If you are retired and receive a pension, V12 Retail Finance may ask for proof of sufficient income. Can I still have my order shipped to a different address? Unfortunately, when choosing to pay with Finance, we can only ship your order to your billing address. Orders paid for using a finance option will only be dispatched to the billing (finance agreement) address, regardless of whether you choose an alternate delivery address when placing your order. For Buy Now Pay Later agreements you can borrow up to £5,000. Deposits are not included in this value. If your order total is £6000, you can pay a £1000 deposit and apply for the remaining £5000 on Buy Now Pay Later. For Classic Credit agreements you can borrow up to £15,000. As above, this does not include the deposit amount. Frank Wilkinson Cameras Ltd. have partnered with V12 Retail Finance Limited ("V12") to offer you a flexible and affordable option to pay on finance. V12 is the UK's only specialist provider of Retail Point of Sale Credit, providing finance options for more than 20 years through its industry leading online paperless processing system. If your application is successful, you will enter into a Credit Agreement with Secure Trust Bank Plc (V12's parent company) which will be administered by V12. V12 is authorised and regulated by the Financial Conduct Authority. Secure Trust Bank Plc is authorised by the Prudential Regulation Authority and regulated by the Financial Conduct Authority and the Prudential Regulation Authority under registration number 204550. Frank Wilkinson Cameras Limited acts as a credit intermediary offering credit products from V12 Retail Finance Limited. 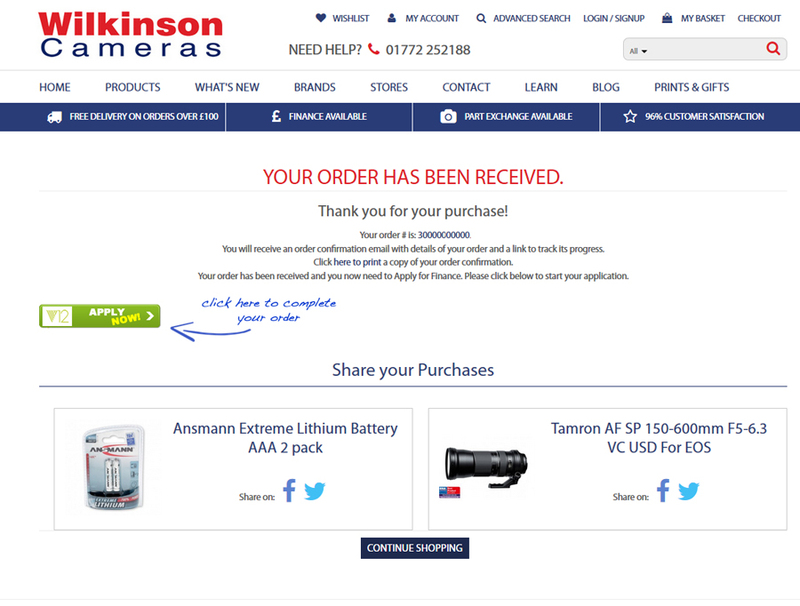 Frank Wilkinson Cameras is authorised by the FCA with credit licence number FRN672245. Credit is subject to age and status.